Robert Rauschenberg started out as a photographer and continued as one for his whole life: “I’ve never stopped being a photographer” he once said. At the beginning, he could not decide whether he wanted to be a painter or a photographer, and was obsessed by an unattainable project: photographing his country inch by inch. At Black Mountain College he met photographers such as Aaron Siskind and Harry Callahan and also took his first photographs, which included Quiet House – Black Mountain College (1949), a diagonal stream of light on the wall of an empty room. This work is also part of the Rauschenberg/Photographs portfolio, published by the Sonnabend Gallery, New York in 1980, which contains 12 photographs dated from the 1950s. Rauschenberg’s wish was to work “in the gap between art and life” - probably his best-known and most widely quoted phrase. Right from the beginning, photography was the procedure he chose to fill the gap, although it was not the only one. According to the artist himself, his interest in photography came about because of a personal conflict between curiosity and shyness, and he used the camera to defend himself. In the late 1940s, art was going through a sublime moment, Abstract Expressionism, which this photograph approaches with its painterly texture. 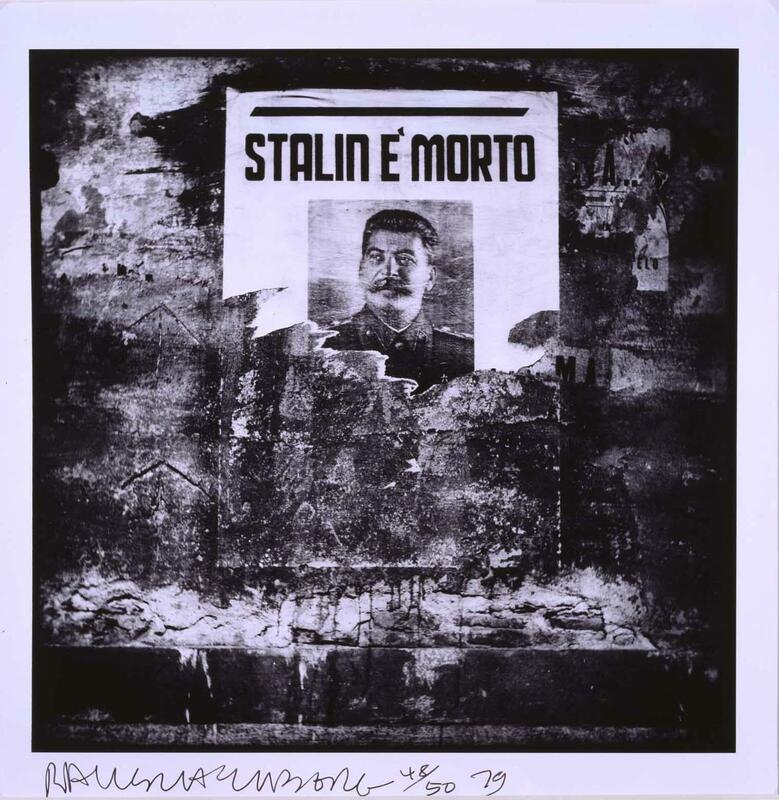 But it is also a torn portrait of the recently deceased Soviet dictator, photographed by Rauschenberg in Rome during his travels around Europe and North Africa, by the end of which he had settled on the idea of deliberate provocation, humour, playfulness and questioning: these things are also part of the history of art and should be employed from time to time, especially when there is a glut of seriousness and dogmatism. Robert Rauschenberg In Black And White : Paintings, 1962-1963, Lithographs, 1962-1967. / Robert Rauschenberg. Rauschenberg, Robert ( 1925-2008)Balboa : Newport Harbor Art Museum, 1969. Robert Rauschenberg : Night Shades & Urban Bourbons / Robert Rauschenberg. Rauschenberg, Robert ( 1925-2008)Basel : Galerie Beyeler, 1995. Rauschenberg overseas culture interchange : Roci / Robert Rauschenberg. Rauschenberg, Robert ( 1925-2008)Washington : National Gallery of Art, 1991.